Where were we to blame? The inventory was ours, not the other man's. “All A.A. progress can be reckoned in terms of just two words: humility and responsibility. Our whole spiritual development can be accurately measured by our degree of adherence to these magnificent standards." “Shoemaker, stick to thy last!” . . . better do one thing supremely well than many badly. 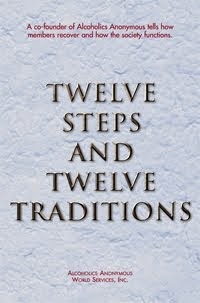 That is the central theme of this Tradition [Five]. Around it our Society gathers in unity. The very life of our Fellowship requires the preservation of this principle. Suddenly the thought crossed my mind that if I were to put an ounce of whiskey in my milk it couldn't hurt me on a full stomach. I ordered a whiskey and poured it in my milk. I vaguely sensed I was not being any too smart,but felt reassured as I was taking the whiskey on a full stomach. The experiment went so well that I ordered another whiskey and poured it into more milk. That didn't seem to bother me so I tried another. Thus started one more trip to the asylum for Jim. 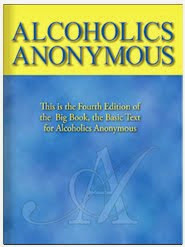 Source: c. 1939, Alcoholics Anonymous, More About Alcoholism, p. 36. When brimming with gratitude, one’s heartbeat must surely result in outgoing love, . . . . He who wherever he goes is attached to no person and to no place by ties of flesh; who accepts good and evil alike, neither welcoming the one nor shrinking from the other — take it that such a one has attained Perfection.